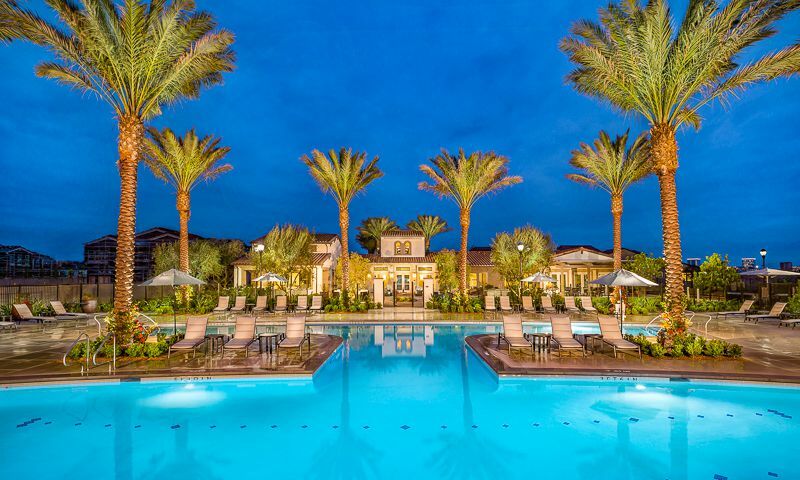 Travata is a 55-plus community located in Irvine, California. Once completed, this low-maintenance community will include 243 attached and single-family homes. There will be several resort-style amenities in the community, including a large clubhouse, fitness center, and saltwater pool. 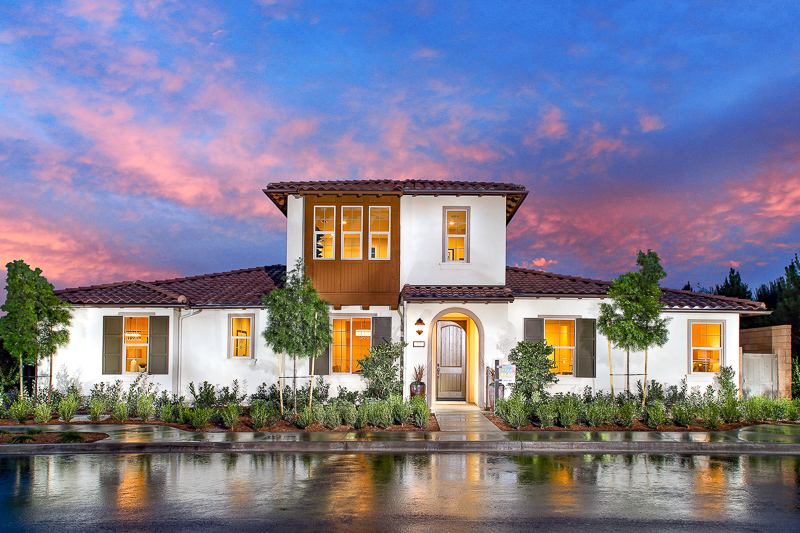 Its location in the master-planned city of Irvine will give homeowners access to world-class shopping, dining, and entertainment options just steps from their front door. Amenities in Travata center around The Travata Club, a clubhouse that will include a fitness center, great room, and a bar and lounge. Residents will also be able to take advantage of the clubhouse’s California room, meetings rooms, office space, and catering kitchen. Outdoors, residents will find a saltwater pool with lap lanes surrounded by a large patio with lounge chairs. Also near the clubhouse will be bocce ball courts, pickleball courts, a yoga lawn, and a dog park. 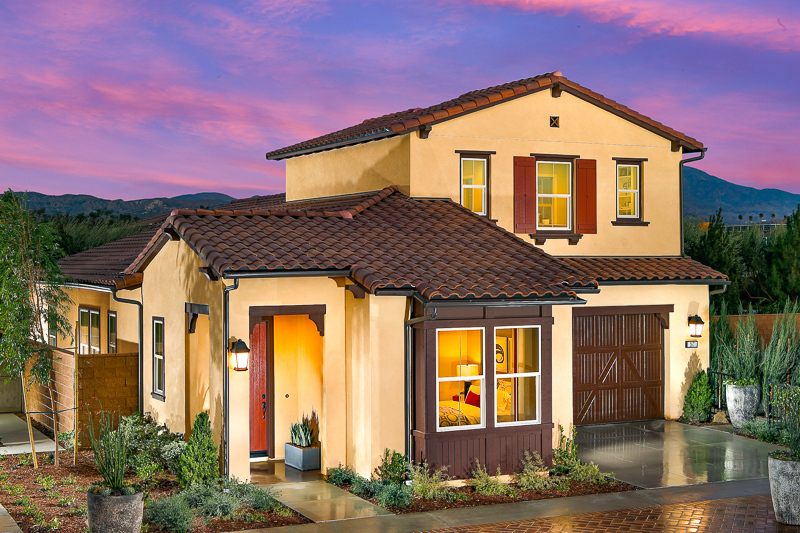 Lennar Homes started construction on Travata in 2017. Upon completion, the community will include 243 attached and single-family homes. There are three neighborhoods in the community that include unique home collections with four or five floor plans each. The Aldea neighborhood will include four different home plans ranging from 1,417 to 1,910 square feet of living space. They include one or two bedrooms, one-a-half to two bathrooms, and one or two-car garages. These homes include features like large great rooms, modern kitchens, walk-in closets, covered porches and patios, and elevator access for two-story homes. Prices for Aldea homes have not been announced. The Castillo neighborhood will be single-family and attached homes coming in four different floor plans. The homes run from 1,281 to 1,973 square feet and include two or three bedrooms, two bathrooms, and two-car garages. Features inside the homes include contemporary kitchens, walk-in closets, first-floor master suites, and private backyards. The largest collection of homes is in the Palencia neighborhood, which includes five different floor plans. All homes are single-family and include 1,848 to 2,567 square feet. They include two or three bedrooms, two to two-and-a-half bathrooms, and two-car garages. These homes include features like open plan, upscale kitchens, first-floor master suites, walk-in closets, and California rooms. With dozens of private amenities and an ideal location in Irvine, homeowners at Travata will enjoy an active, resort-style lifestyle. At the community residents will be able to participate in bocce, pickleball, yoga, and BBQs. As the community grows there are sure to be several clubs and community events held throughout the year. Homeowners can rest easy knowing their homes are low-maintenance. The homeowners’ association will take care of lawn care, irrigation, and outdoor maintenance while residents enjoy their free time. 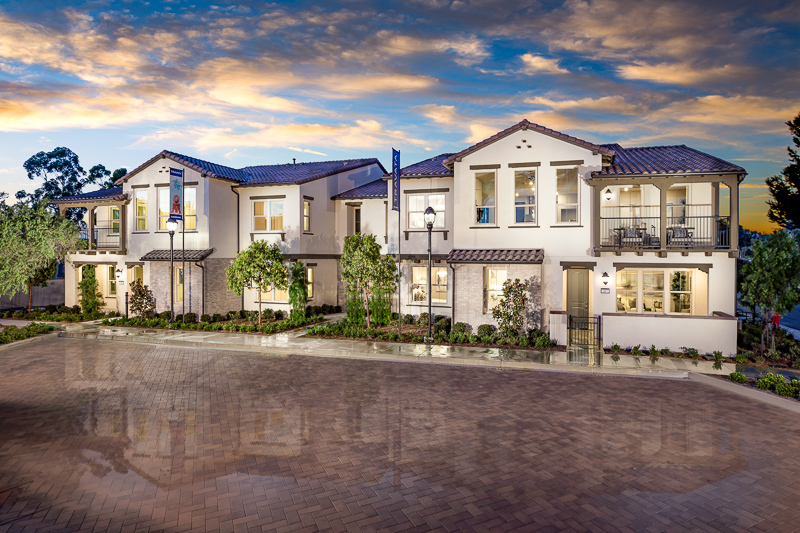 Travata is ideally located in the master-planned city of Irvine. Homeowners will have everything they need from shopping to entertainment to dining within a few miles of their homes. Nearby shopping centers include Cypress Village Shopping Center, Woodbury Town Center, and Irvine Spectrum Center. Residents will be able to grocery shop at Albertson’s, Trader Joe’s, and Whole Foods. There are a wide variety of restaurants to try nearby, including Peppinos Italian Family Restaurant, Javier’s Restaurant, and Taiko Japanese Restaurant. As expected, there’s no shortage of retail options near Travata, which include The Home Depot, HomeGoods, Kohl’s, and Nordstrom. The community is near several golf courses like Oak Creek Golf Club, Tustin Ranch Golf Club, and Rancho San Joaquin Golf Course. Residents will never be far from medical centers like Hoag Hospital Irvine, UC Irvine Health Center, and Saddleback Memorial Hospital. Besides the convenience of being in a master planned city, Travata is also close to several large natural spaces like Limestone Canyon Regional Park, Whiting Ranch Wilderness Park, and Chino Hills State Park. The community’s location in southern California and near Interstate 5 means residents are just 40 miles away from Los Angeles. There is an almost endless amount of attractions in Los Angeles for homeowners to enjoy, including Griffith Park, The Getty, Santa Monica Pier, and general sightseeing. Sports fans will also enjoy having two sports teams from every major league in Los Angeles and nearby Anaheim. With so many amenities in the community and in Irvine, there is truly no better option in Orange County for active adults than Travata. The Travata Club - Coming Soon! There are plenty of activities available in Travata. Here is a sample of some of the clubs, activities and classes offered here. The Aldea neighborhood will include four different home plans ranging from 1,417 to 1,910 square feet of living space. They include one or two bedrooms, one-a-half to two bathrooms, and one or two-car garages. These homes include features like large great rooms, modern kitchens, walk-in closets, covered porches and patios, and elevator access for two-story homes. Prices for Aldea homes have not been announced at this time. Please Note: Floor plans are not available at this time. The Castillo neighborhood will be single-family and attached homes coming in four different floor plans. The homes run from 1,281 to 1,973 square feet and include two or three bedrooms, two bathrooms, and two-car garages. Features inside the homes include contemporary kitchens, walk-in closets, first-floor master suites, and private backyards. Please Note: Floor plans are not available at this time. The largest collection of homes is in the Palencia neighborhood, which includes five different floor plans. All homes are single-family and include 1,848 to 2,567 square feet. They include two or three bedrooms, two to two-and-a-half bathrooms, and two-car garages. These homes include features like open plan, upscale kitchens, first-floor master suites, walk-in closets, and California rooms. Please Note: Floor plans are not available at this time. 55places.com is not affiliated with the developer(s) or homeowners association of Travata. The information you submit is distributed to a 55places.com Partner Agent, who is a licensed real estate agent. The information regarding Travata has not been verified or approved by the developer or homeowners association. Please verify all information prior to purchasing. 55places.com is not responsible for any errors regarding the information displayed on this website.